You heard million times that blockchain is the future of business. It is often considered a panacea for fraud, corruption, piracy, and other global problems companies encounter day by day. However, the benefits blockchain offers to big enterprises seem to be a far cry from the issues we encounter in our daily lives. According to HSBC survey, 80% of people who heard about the technology don’t understand what exactly it is and therefore are not aware of the opportunity to make more money with blockchain. But as we know — seek and you shall find. We compiled a list of 4 ways of making money on blockchain with minimal investment. Check them out: probably one of them is exactly what you were looking for. If you keen on writing, you might be thinking to create a blog and make money for at least once in your life. However, it is quite difficult to earn quick cash on writing for your own blog since its monetization requires a lot of time, effort, and sometimes money investment. It can bring you a good revenue, but only if you are patient enough. Fortunately, there are some other methods to start if you feel that earn living writing is for you. Aside from freelance writing gigs, you can register on blogging platforms like Medium and publish articles on any topic you want, receiving cash compensation for quality content. There is an analog of Medium in a world of blockchain called Steemit. Similarly to Medium, the platform pays users for publishing quality content but using its own cryptocurrency — STEEM. Each time readers upvote your post, you get a fair share of the reward. Even if you have a well-paid full-time job, there is always room for extra income. When it comes to quick ways to establish an additional revenue stream, a side hustle is the first idea that comes to mind. It became easy enough to find a gig in a matter of days with a spread of freelance marketplaces like Upwork, Toptal, Gigsters, etc. In a myriad of currency-based freelance marketplaces, you can track down a few ones built on blockchain. They operate similarly to platforms like Upwork, matching clients with right freelancers and encouraging clients to pay for freelancer’s work through an escrow system Afterwards, both parties leave feedback to each other. Positive or negative feedback affects user’s rating that serves as a reputation indicator. The only difference: blockchain marketplaces support payments in cryptocurrency and are more focused on security. For example, Cryptogrind is one of those services with a good selection of jobs in various categories including software development, digital marketing, graphic design, etc. The platform accepts bitcoins and offers storage in cold wallets (private keys are never transmitted through the web and all earnings in crypto are stored offline). Nowadays, you don’t have to produce any goods to make the profit on them. All you need is to buy a product from the manufacturer at wholesale cost and resell it at retail prices. You can observe the bright examples of such entrepreneurship on Amazon where a lot of branded products are listed by third-party sellers. However, Amazon is just the most popular marketplace to buy and sell goods online. And for sure, it has a number of shortcomings. The most notable of them are monthly fees for about $40 and commission rates paid from each purchase. OpenBazaar is an alternative for Amazon based on blockchain. The marketplace connects sellers and buyers via a peer-to-peer network and only act as a virtual place where clients meet their customers. Thus, there is zero platform fees and zero centralized control over transactions at OpenBazaar, what gives sellers more freedom and boost their revenue. Not only the majority of people don’t know how blockchain works, but the majority of startups are not aware of how to integrate the technology with their business processes. According to the recent statistics, only 16% of companies across all industries fully adopted blockchain. The rest of enterprises got stuck in the “getting aware” or “experimenting” phases. One of the toughest challenges companies face today is their staff education. Blockchain developers and other specialists are rare birds so far, therefore it’s easier to educate existing employees. As the result, blockchain consultancy services are extremely in demand. If teaching is your passion, you can dedicate some time to learning more about blockchain technology and how it can be possibly applied in business. But actually, there are two ways to earn money on teaching blockchain. We described the harder one, as “blockchain for enterprises” has relatively long learning curves. If you seek an easier one, become a “blockchain for dummies” instructor. Thousands of people need someone to give them the plainest ever explanation of blockchain. If you can make complex concepts simple, this job might be yours. As you can see, it’s not necessary to be a big business to reap some benefits from the hyped technology. 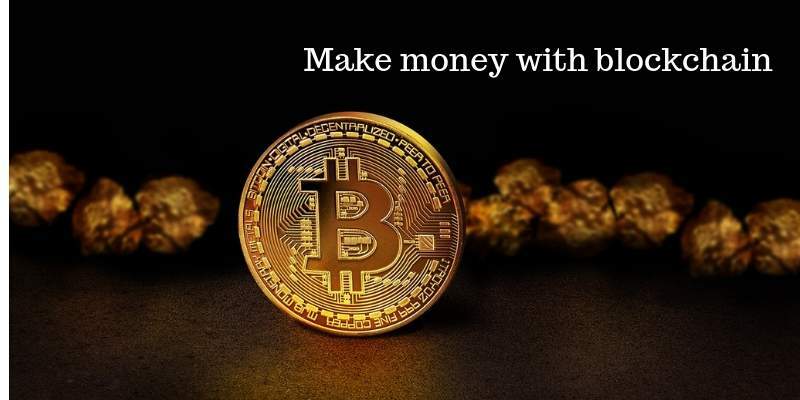 Anybody wishing from 15 to 99 can use blockchain to their advantage and earn money in cryptocurrency without prior investment.